Waiting for the bus or your next class has never been so fun! A wonderfully engaging physics based puzzler; Six! provides a complete workout for your fingers as you struggle to keep a simple hexagon from tumbling down. Six! was developed by GramGames who are the mastermind group behind global hit games 1010 and Merged. The game is available to download and play for free on the iOS from the Apple iTunes Store. In a compact size of 85MB, this game provides quite a lot of eye candy and a simplistic user friendly interface for players. The objective of Six! is to help a hexagon on its path from the top of a tower to the bottom without making it tumble over the edge or the tower falling apart. Deceivingly simple at first look, you will begin struggling after the first few blocks as you realize that keeping the blocks stable while clearing a path for the hexagon is a huge challenge. Like any other puzzler, Six! 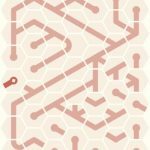 offers you the complete gameplay experience only if you put your complete mental concentration into figuring out the ways that the blocks can be shifted to make way for the hexagon. However, the challenge can be so great sometimes that you will be tempted to put down your phone in frustration. You have come to the right place if you are facing this dilemma because reading on, you will be introduced to some tips that will help you combat the extreme competitiveness of this game. Six! is a delightfully challenging game but it does give you the allowance that there is no time limit sword hanging over your head. Although this doesn’t make the game any easier, it does well to relax you while you come up with an effective strategy to make the hexagon reach its destination safely. Remember, time is your friend so it is advised not to be hasty with your fingers while tapping the screen. It is tempting to remove many blocks at once and very satisfying to see the hexagon slide down a few floors. 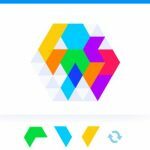 However, going at the same pace you will soon come to a point where the blocks are arranged in such a pattern that any accidental tap may cause the whole tower to come tumbling down or worse your hexagon to roll over from the side of the tower. As the age old saying goes, patience always leads to sweeter rewards, Six! is an exact application of this. Instead of regretting your hasty move later on, try to visualize all possible positions that you can slide the blocks to make a path for the hexagon to come down easily and more importantly smoothly. More than a few patterns exist for the sliding movement of the blocks and always remember that you have all the time in the world (in game of course) to try as many of them as you like before you are ready to be called a master of Six! In Six!, you might have noticed that the game does not allow you to tap two blocks simultaneously. This restriction in the game makes it increasingly difficult to manage your taps on the screen as you move down the tower. The blocks also start to become more unstable and prone to wobbling as the tower height decreases. This is just the game doing its part to exponentially increase the difficulty level to make Six! more of a challenge for you. Gladly for you there is an excellent workaround to this restriction in the game. Instead of trying to tap two blocks at the same time, you need to tap a block immediately after tapping the previous block making both of the blocks disappear without any noticeable delay. This trick comes in handy particularly when you remove a block and your hexagon tumbles down on another block that would cause it to roll sideways out from the tower. 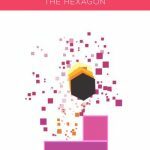 Tap immediately on that troublesome block and easily get rid of it creating a clear path for the hexagon to safely slide through to the lower stages. The consecutive tap trick works exactly as the name suggests and be forewarned it takes a considerable amount of practice to learn to perform the move as quickly as mentioned here. The rewards are great but you will have to put in the effort to learn this trick before you can begin to see effective results. Remember, practice makes a man perfect so pick up your phone and start tapping to the instructions until you become perfect at it. Six! is a game all about a single hexagon and its friendship or enmity rather with the blocks that make up the tower that it is standing on top of. In order to succeed at this game you need to think like the hexagon, move like the hexagon and quite literally become the hexagon! The blocks may be providing you support but their movement is completely random and while some blocks may move exactly in the direction that you intended them to, some mischievous blocks tend to roll over to the opposite side causing mayhem altogether and wasting all your time. Learn to read the movement of the blocks and don’t focus on the hexagon alone. Some blocks are wobbling as you tap on them. These are the mischievous blocks and you need to be wary of them. Prepare in advance that they will roll in haywire directions so that you can quickly make room for the hexagon to land safely in the next row of loyal blocks. 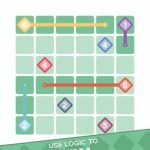 GramGames have made a challenging puzzler to keep you engaged but they have also added a small bonus for those who fail in their war against the blocks. The Last Call bonus is a way to bump up your high score just before the “game over” screen flashes. When the hexagon starts to roll over, immediately start tapping all the blocks left below to get a sweet score boost. The objective of this bonus is quite simple; failures lead to success and that is the message that GramGames is trying to convey using the Last Call!